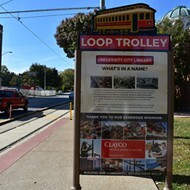 Forget, for a minute, that other trolley — the $51 million one that will be able to take you from Delmar to the Missouri History Museum, supposedly, maybe, one of these days, so long as you want to do it Thursday through Sunday. Nay, there is a new trolley in town this holiday season, and it's going to the best places: both Candy Cane Lane and the A-B Brewery. 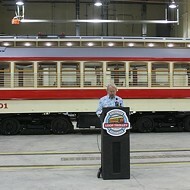 Per the organizers, "Our trolley is enclosed, heated, and decorated and will be playing holiday music. Feel free to bring snacks aboard." Now, these tours aren't cheap — tickets will cost everyone but babies $20/each — but they do have a monumental advantage over the trolley about to start running through the Loop (and no, we're not just talking about the fact that this one actually exists). 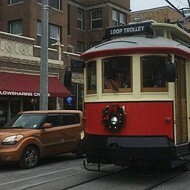 The Candy Cane Lane Holiday Lights Tour trolley doesn't need old-fashioned tracks! 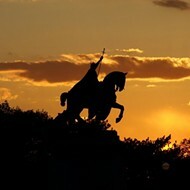 It can run right there on the roadways like any other car, thereby sparing us all years of construction, millions of dollars in tax money and month after month of federally mandated training for its operators. How amazing and high-tech is that? 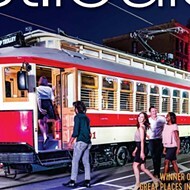 And thanks to the stunning new-fangled technology that lets these trolley cars run on the road, they don't have to go only to the Missouri History Museum and then turn right back around again on their old-timey tracks. They can go from the suburbs to area light displays, just like that! Get your tickets online here. 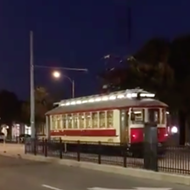 And when you see a trolley running without tracks beneath it, try not to faint from excitement. This 2018; we're all out of smelling salts.